I absolutely adored the Royals series which was when this writing duo first joined forces and they gave me everything that I love…especially angst and teenage drama. While When It’s Real is not on the same scale it still had all those traits that I first fell in love with. 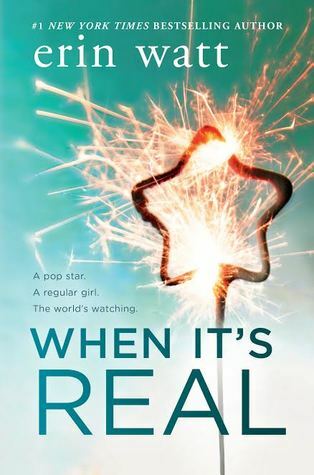 In When It’s Real we are also treated to some of my favourite tropes…rock star falls for a “normal” woman and who doesn’t love a fake girlfriend? Couple this with angst and drama and you know that you are always going to get an entertaining read and it was just that. Oakley Ford was a child rock star, emancipated from his famous parents because they were jealous of his own success. He hit the charts in his early teens and now has plateaued. He feels his “sound” is old and he wants his new music to be a reflection of the fact that he has grown up, he wants to reinvent himself and there is only one person he wants to do it with. King, the producer he desperately covets is unwilling to work with him, he sees him as a loose cannon, unsettled and so Oak’s team come up with the “fake girlfriend” stability and settling down angle to entice him. Vaughn is the girl next door type, extremely intelligent but her life is stifled by the situation her family finds themselves in. Vaughn is currently taking a year out to look after her little brothers as since the death of her parents, Vaughn and her sister have become both mom and dad. Their little family is in desperate need of money and it seems their answers may have come all at once. The dynamic between Oak and Vaughn is tenuous at best, these two rut against one and other, especially once all the “advisors” get involved. Vaughn is far from superficial, she has her long-term boyfriend and her family’s best interests at heart, but when this charade gets awkward it is not long before tension is rife from both the men in her life. I loved how these got to know one and other first, how they naturally progressed from bitter enemies to friends and then more. Their journey felt organic rather than forced and made their relationship all the more believable. Oak was like an onion and with every layer that Vaughn managed to strip away she got to see more of the real person underneath. Misunderstood, career minded, a perfectionist but most of all…he was lonely. Fickle friendships par for the course and everyone out for what they could get…except Vaughn. This does have a little angst and drama but nowhere the same level as the Royals, but the plot flowed effortlessly and this was an easy read for me. This was a book easy to escape into and one that kept the pages turning with the budding relationship between Oak and Vaughn. To see the real Oak was heart-warming and as we got to understand him more, his character only became more lovable. I would say however that this, for me, would be a more mature YA novel.